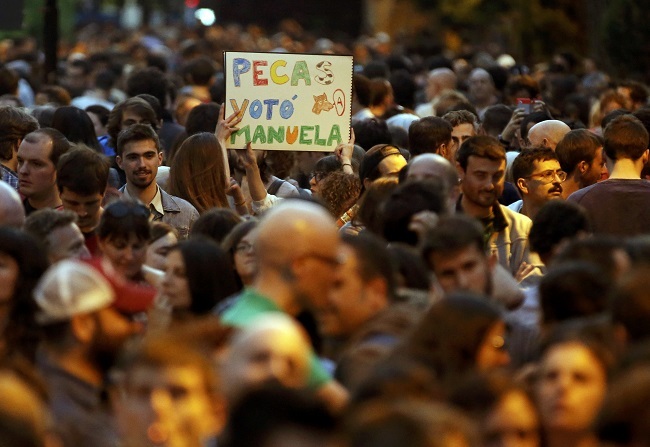 These citizen’s movements managed to win the city councils of the country’s two most important cities, Madrid and Barcelona, as well as A Coruña and Santiago de Compostela in Galicia, Zaragoza in Aragon and Cadiz in Andalusia. Those breakthroughs have stirred up politics in Spain like nothing since the birth of the indignados movement in May 2011. The right-wing media headlines read: “Indignados take Madrid” and “Colau okupies Barcelona City Council”. (In Spanish an okupa is an anti-eviction squatter, and widely respected anti-eviction activist Ada Colau will be Barcelona’s first ever woman mayor). These triumphs represent the high-tide mark of an election that has seen the ruling People’s Party (PP) vote fall to 27% (from 37.54% in 2011) and the opposition PSOE vote drop to 25% (from 27.03%). Since the last local elections the PP has lost around 2.5 million votes, while the PSOE has lost 700,000. The all-of-Spain vote for Citizens, the right wing “anti-Podemos”, was only 6.55%. Nonetheless, despite these breakthroughs, a majority of the country’s provincial capitals and 11 of the 13 autonomous communities will continue to be run by either the PP or PSOE. The possible exceptions are the Canary Islands, which may continue to be governed by regionalist force the Canary Coalition (CC) and Navarra, where the local branch of Podemos holds the key to whether a four-party left and centre-left coalition can be built to replace the corrupt and reactionary regime of the incumbent Union of the People of Navarra (UPN). This result comes from the unevenness of the leftward moving tide. It has been strong enough to wipe out all the PP’s previous absolute majorities, but not so strong as to remove the PP as the party still with the relative majority in 37 of the Spanish state’s 50 provincial capitals. Nonetheless, in many regions and cities the conservative ruling force is now vulnerable to losing government to left and centre-left coalitions—provided these can be built. In most of these anti-PP replacement alliances the PSOE will be the leading partner, even though in one at least, the Community of Valencia, there will a struggle to see which force will be hegemonic, the PSOE’s local affiliate, the Socialist Party of the Valencian Country (PSPV) or the regionalist Valencian force Commitment. In brief, the shift on May 24 was powerful enough to wash away much of the PP’s municipal base of influence and perks, but not so uniformly powerful as to lift the radical left above the PSOE except in a minority of cases—very important and exemplary though these are. Where Podemos and IU ran in competition, either alone or behind their own particular brand of “broad” campaign, their vote was sometimes good, sometimes quite disappointing, and sometimes downright disastrous, especially for IU. Their combined vote was very rarely big enough to overtake both the PP and the PSOE, two exceptions being the autonomous community of Asturias and the provincial capital Cadiz. For a bigger breakthrough to have happened, there would have had to been more campaigns of the kind that won Barcelona and Madrid, at both city and autonomous community level. However, the opportunity to surpass both PP and PSOE still remains—on condition that the lessons of this election can be learned and applied before the vital November national elections. At the level of the Spanish state, the vote to the left of the PSOE was between 20% and 25%. This figure is based on the 4.76% vote in the municipal elections for IU, the 9.9% for various left and centre-left nationalist and regionalist parties and the all-of-Spain Green party Equo[i], and some part of 15.36% won by “others”. “Others” covers some of the citizens’ lists that represented some degree of left unity and/or bottom-up organising. Podemos managed to overtake the PSOE in only one autonomous community, Navarra. It scored 13.7% to the PSOE’s 13.4% (in fourth and fifth position behind the ruling right-regionalist Union of the People of Navarra, the centre-left regionalist Geroa-Bai and the left-nationalist EH Bildu). However, Podemos also beat the PSOE in the Basque Country (Euskadi), where in the elections for the three regional deputations into which Euskadi is divided, it became third force behind the ruling right-nationalist Basque Nationalist Party (PNV) and EH Bildu. Podemos won 13.93% against the PSOE’s 13.82%. Podemos came closest to the PSOE in Aragon (20.5% to 21.4% for the PSOE), the Balearic Islands (14.7% to 18.95%) and the Madrid region (18.6% to 25.5%). In Asturias, the combined IU and Podemos vote (30.9%) was greater than the PSOE’s (26.4%). Thus, where the left tide reached its high point, the heaviest defeats were also inflicted on the two-party Spanish establishment (dubbed in indignado circles as the “PPSOE”). For example, in Barcelona, the most left-wing city in the Spanish state, the total vote to the left of the PSOE’s Catalan sister party, the Party of Socialists of Catalonia (PSC), leaped from 17.93% in the 2011 council poll to 43.64%, the combined score of Barcelona Together, the Republican Left of Catalonia (ERC) and the Popular Unity Candidacies (CUP). In 2011, these forces had seven seats on the 41-seat city council, today they have 19. Over the same period the combined vote for the PSC and PP has fallen from 39.38% to 18.33% (20 seats to seven). The leftward surge has also affected the balance of forces within the bloc of Catalan pro-independence parties—the ERC, CUP and the right-nationalist Convergence and Union (CiU), ruling in Catalonia and until May 24 running Barcelona as well. Before this election the city council in Barcelona, the least nationalist-minded city of Catalonia, had 14 CiU councilors and two ERC councilors. There were also five councilors representing the alliance between Initiative for Catalonia—Greens and the United and Alternative Left (ICV-EUiA), which supports a Catalan right to decide and the formation of a Catalan state, but not necessarily Catalan independence. After May 24, the Catalan nationalist bloc has 18 councilors (10 CiU, 5 ERC and 3 CUP), while Barcelona Together, which has basically the same orientation as ICV-EUiA, has 11. Left and centre-left Catalan nationalism is now in a stronger position against right-nationalism, while those forces supporting a Catalan right to decide have a clear majority on Barcelona city council for the first time ever. In the race for the 57-seat Madrid city council, Madrid Now!, in which Podemos merged with a series of splits from IU, won 31.8% of the vote (20 seats). This consisted of the vast majority of those who had voted IU in 2011 and around a third of those who had voted PSOE in that poll. The Madrid Now! vote more than doubled that of the PSOE (15.2%). In Madrid city the left in the broadest sense (including the PSOE) has won 29 seats against the 28 won by the right (PP 21, Citizens 7), meaning that retired judge and former labour rights lawyer Manuela Carmena will be the new mayor of a city that the PP has run for 24 years. During this time it has become a massive black hole of real estate, banking and party-political corruption. In Zaragoza, the capital of Aragon, Zaragoza Together (24.5%), bringing together Podemos and IU political spheres as well as many non-aligned activists, will win control of this important industrial city if, as seems likely, it can convince the PSOE (18.6%) and the left-nationalist Aragonist Union (6.7%) to ally with it. In Cadiz, the Podemos-inspired ticket For Cadiz, Yes We Can! won 27.9% of the vote, enough when combined with the PSOE (17.3%) and the IU-inspired Winning Cadiz Together (8.4%), to end the 20-year rule of the PP. In Galicia, the most stunning victory was that of Atlantic Tide in A Coruña, taking 31% of the vote to the PP’s 30.9% and completing overturning the established Galician pattern of a PP majority being opposed by a minority made up of the PSOE’s Galician affiliate (Party of Socialists of Galicia, PSG) and the Galician Nationalist Bloc (BNG). In the 27-seat council, the Atlantic Tide’s 10 seats came through the PP losing 4, the BNG 3, and the PSG 2. Its last seat came from IU, which had joined Podemos, the left-nationalist Anova, the centre-left nationalist Commitment to Galicia, Equo, the Galician Ecosocialist Space and the Humanist Party in creating what is probably the broadest organised left support for a citizens’ electoral platform in the Spanish state. Indeed, Galicia, with the formation of the Galician Left Alternative (AGE) in 2012, has been the pioneer of such left unity and citizen-based organization. The other extraordinary result in Galicia was in Santiago de Compostela, where Martiño Noriega, the outgoing mayor of Teo and leader of ANOVA, led the Open Compostela platform to a 34.58% vote, again ahead of the PP, BNG and PSG. The PSG vote more than halved from 30.96% to 14. 65% in a city that has never been governed by any party besides the PP and PSG. On May 25, PP prime minister Mariano Rajoy finally appeared before the Spanish national media to explain what had gone wrong: the PP’s good policy that had rescued Spain from economic disaster had been poorly explained because he and his ministers had just been too busy saving the country from the disaster created by their PSOE predecessors. There would be better communication in future, but no change to the government’s line, no cabinet reshuffles and he would be its lead candidate in the coming national poll. The PP rank-and-file, especially those who are about to lose their offices and cars, will be wondering what planet their leader is living on or what substances he has been taking. After May 24, the PP has already lost Extremadura, the Valencian Community and the Balearic Islands, where it recorded its worst-ever result (28.5%). Depending on what alliance can be built to its left, it also stands to lose Castilla-la Mancha (to a PSOE-Podemos alliance), Aragon (to a four-party alliance of PSOE, Podemos, IU and the Chunta) and Cantabria (to an alliance of the Cantabrian Regionalist Party, PSOE and Podemos). Its reactionary regional ally in Navarra, the UPN, could fall to an alliance of GeroaBai, Bildu, IU and Podemos provided Podemos can bring itself to ally with Bildu). In the Madrid regional government, Castilla y León, Murcia and La Rioja, where it enjoyed absolute majorities before May 24, the PP will now be dependent on Citizens as its lifeline. But at what price will Citizens give this support, vulnerable as it is to the jibe that it is just the PP with a new paint job? The same fate hangs over the PP in around half of the provincial capitals in which it preserved a relative majority. Besides the provincial capitals already mentioned, the conservatives have already lost or could readily lose 18 more[ii] and they will be dependent on Citizens to come to their rescue in another 16. [iii] The UPN is on the ropes in the capital of Navarra (Irunea-Pamplona). What we are seeing is the beginning of the end of the PP’s semi-feudal strongholds—like Galicia, Castilla y Leon—those regions and cities where it has governed unquestioned for two decades or more, and where its rule has up until now been underpinned by roughly the same social strata as sustained the Franco dictatorship. March 24 shows that the six years of economic crisis are creating the social turmoil that is now beginning to destabilise previously unbreakable PP majorities. For many voters deserting the PP Citizens will be their first port of call. Yet not for everyone: at these elections, while the PP vote fell 10.6%, Citizens only managed to win 6.55%. Immediately it became clear that she was doomed after two decades of flamboyantly corrupt rule, the PP mayor of Valencia, Rita Barberà, issued a desperate plea to the local PSOE leader Ximo Puig to join her in a grand alliance against the “radical extremism” represented by Compromise and Podemos. Her offer was declined. The PSOE leadership knows that the tide of sentiment is flowing leftwards, and so it is talking left. “The PSOE will participate in the creation of left governments that will be the beginning of the end of the PP nightmare”, said PP leader Pedro Sánchez after the party leadership had studied the results of May 24. The idea is to try to reinforce the claim that the PSOE is the only practical governmental alternative to the PP, and to put the pressure on Podemos not to stop the creation of such administrations. Already, two months after the March Andalusian election, where the PSOE won a relative majority, a government has not been formed, because neither Podemos, Citizens nor the PP want to be seen to be responsible for returning the PSOE to power. As a result, Andalusian premier Susana Diaz is increasing her rhetoric about “an objective alliance” between Podemos and the PP, and threatening to go to another election. Because the PSOE vote declined less than the PP’s it has been possible to present its result as a victory. It has won back Extremadura and increased its vote in Asturias, where it was governing. It has a good chance of becoming the leading party in coalitions governing the Valencian Community, the Balearic Islands, Aragon and Castilla-La Mancha. It could govern in coalition with on the Canary Islands, and might even be able to persuade Citizens not to let the PP continue to rule in the greater Madrid region. However, the PSOE has serious problems, precisely in the regions where the leftward shift was greatest. On Barcelona city council, which it administered for 32 years, and where it was still the second party in 2011, it is now fifth. In the parliament of the Community of Valencia, its vote fell from 28.8% to 20.3%, as it was almost overtaken by Commitment (18.2%). A similar fall took place in Aragon (down 8.6%), in parallel with the strong campaign of Podemos. In an election with the PP in free fall, the PSOE could only manage to increase its vote in one autonomous community, Murcia. While the result of Podemos was not the huge leap projected when it was briefly leading in some national opinion polls at the beginning of the year, it is still represents a very big advance for the left as a whole, with its epicentre in the winning citizens’ platforms already mentioned. This is a rough initial account of the May 24 municipal and regional election in the Spanish state, and will be developed over the coming weeks. One particular area that needs more study is the result for left nationalist forces, marked by a leap forward in Catalonia (tripling of the number of CUP councilors), but with a setback in Euskadi, where Bildu lost to the PNV in Donostia-San Sebastian and the Guipuskoa region. It should not finish without a celebration of the political demise of some very nasty characters on the Spanish political scene. The leftward shift in these elections has had as a positive by-product the near destruction of the Union for Progress and Democracy (UPyD), with its obsessional rant against the Basque and Catalan “threat”, as well as the decimation of the racist and xenophobic Platform for Catalonia. In addition, the PP, reduced in Catalonia from 474 councilors to 214 (less than the CUP) will lose working-class and migrant Badalona, which its anti-immigrant mayor Xavier Albiol had promised to “clean up”. Now a four-party left and centre-left coalition really will clean up Badalona—by removing the PP and Albiol from its town hall. The results of May 24 were the first step in a democratic revolution by a people who have been put through misery by six years of economic and social crisis. It opens the door to their taking the next step, the replacement of Spain’s corrupted political system by one rebuilt democratically by the mass of active citizens, of which Barcelona Together, Madrid Now!, Atlantic Tide and the other successful citizens’ platforms have been inspiring harbingers. [i] Namely Republican Left of Catalonia, 2.3%; Commitment (from Valencia), 1.71%; Entesa (Initiative for Catalonia and its allies), 1.64%; EH Bildu (Basque Country and Navarra), 1.38%; the Galician Nationalist Bloc, 0.85%; Equo (all-Spanish green party), 0.25% ; the Aragonist Union (Chunta), 0.19%; Irabazi (alliance of the United Left and Equo in the Basque Country and Navarra) 0.17% ; El Pi (centre-left Balearic regionalist), 0.14%; GeroaBai (centre-left Navarra regionalist), 0.13%; and others. [ii] Segovia, Vallodolid and Zamora (to IU supported by the PSOE), in Castilla y León; Oviedo (in Asturias); Toledo and Ciudad Real in Castilla-La Mancha; Palma, Mahon and Ibiza, on the Balearic Islands; Valencia, Castellon and Alicante (in the Valencian Community); Huesca (in Aragon); Las Palmas (on the Canary Islands); and Sevilla, Huelva and Cordoba (in Andalusia). [iii] Burgos, Avila, Salamanca, Palencia and León (in Castilla y León); Albacete, Cuenca and Guadalajara (in Castilla-La Mancha); Teruel (in Aragon); Badajoz and Caceres (in Extremadura); Logroño (in La Rioja); Santander (in Cantabria); and Jaén, Almeria and Málaga (in Andalusia).